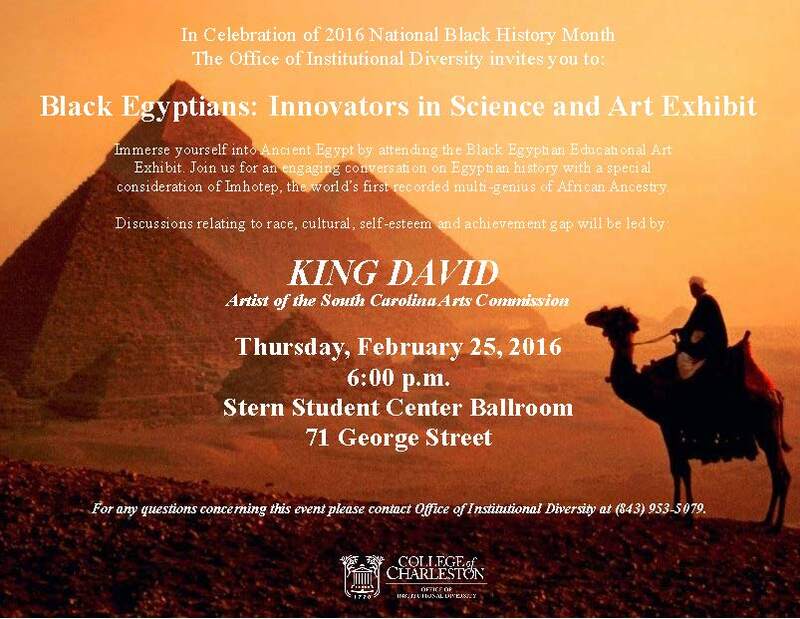 In Celebration of 2016 National Black History Month the Office of Institutional Diversity invites you to immerse yourself into Ancient Egypt by attending the Black Egyptian Educational Art Exhibit. Join us for an engaging conversation on Egyptian history with a special consideration of Imhotep, the world’s first recorded multi-genius of African Ancestry. Discussions relating to race, cultural, self-esteem and achievement gap will be led by KING DAVID, Artist of the South Carolina Arts Commission. For any questions concerning this event please contact Office of Institutional Diversity at (843) 953-5079.